Have you triple checked your code and still not getting the correct results? If the TEST data set is already opened when you run the code, the data set will not show the updated results. Remember to close your data set before overwriting it. 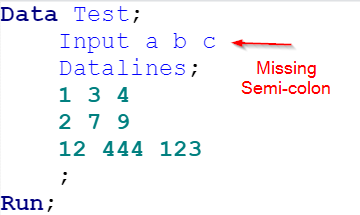 Missing the semi-colon is THE MOST common mistake beginners make when programming SAS. This will no doubt give you an error or warning message in the Log tab. When your code aren't working, check and see if you have made any of the mistakes above.